Shapeabilities Filigree Veil Etched Dies Elegant 3D Vignettes Collection by Becca Feeken is a set of three dies includes an outline veil die with its detailed veil insert die, along with a swirled design accent die. Works with S6-139 Shapeabilities Grand Cabinet 3D Card Etched Dies. Approximate Size: Outline Veil: 3.43 x 4.35 in. 8.80 x 110 cm, Inside Veil Design: 3.15 x 4.05 in. 8.00 x 10.30 cm, Border Embellishment: 3.70 x 1.50 in. 9.40 x 3.80 cm. Shapeabilities Grand Arch 3D Card Etched Dies Elegant 3D Vignettes Collection by Becca Feeken is a set of six dies includes pieces to create an arch multi-layered card. By matching the tabs of each Grand Arch Inlay piece into the Side Panel slots, you create an amazing three-dimensional card. Assembled Size is 5.125 x 4.375 x 1.5" (13.0 x 11.2 x 3.8 cm). Approximate Size: Grand Arch Outline: 4.80 x 5.10 in. 12.20 x 13.00 cm, Grand Arch Inlay: 4.35 x 5.00 in. 11.00 x 12.70 cm, Sentiment Label: 3.00 x 1.00 in. 7.60 x 2.50 cm, Inner Arch: 2.65 x 3.50 in. 6.70 x 8.90 cm, Side Panel: 2.00 x 5.10 in. 5.10 x 13.00 cm, Side Panel Insert: 1.40 x 5.00 in. 3.60 x 12.70 cm. Shapeabilities Swirl Heart Etched Dies On the Wings of Love Collection by Joanne Fink comes in a single die with a beautiful intricate swirl heart shape. On the Wings of Love Collection brings together faith and art for a great creative collaboration by Joanne Fink. Approximate Size: Heart: 4.25 x 4.35 in. 10.80 x 11.00 cm. 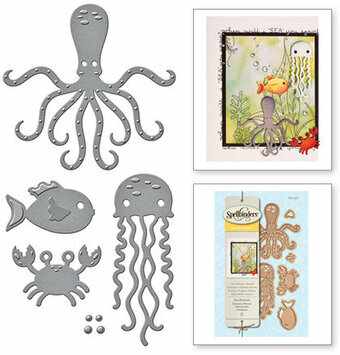 This Shapeabilities Die D-Lites Sea Animals would make an awesome addition to your die cutting collection. Spellbinders Die D-Lites cut, emboss and stencil with a single die template. Use them in your cards, tags, scrapbook pages and more! This set offers a great assortment of sea animals that has to be on your "must have" list for your die collection - get it now! Approximate Size: Eye: 0.10 x 0.10 in, Fin: 0.30 x 0.30 in, Crab: 1.25 x 0.85 in, Fish: 1.25 x 0.75 in, Jelly Fish: 0.80 x 2.40 in, Octopus: 2.40 x 2.40 in. Project Types: Perfect for scrapbook pages, cards, mini albums and mixed media projects. 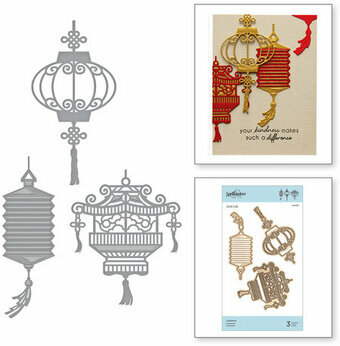 Shapeabilities Lanterns Etched Dies Destination China by Lene Lok is a set of three dies that includes three different styles of lanterns from plain to ornate designs. From detailed frames to intricate accents to beautiful lanterns, Destination China Collection by Lene Lok is a wonderful grouping of Asian inspired elements to bring an exotic flair to your projects. Approximate size: Lantern 1: 2.10 x 4.10 in. 5.50 x 10.50 cm, Lantern 2: 1.35 x 4.05 in. 3.50 x 10.50 cm, Lantern 3: 2.76 x 3.35 in. 7.10 x 8.60 cm. Die D-Lites Reindeer Etched Dies 2018 Holiday is a set of six includes everything you need to create your own kind of reindeer fun. Spellbinders Die D-Lites cut, deboss, emboss and stencil with a single etched die template. Approximate size: Hat: 2.30 x 0.95 in 5.84 x 2.41 cm, Reindeer face: 1.45 x 1.65 in 3.68 x 4.20 cm, Reindeer ears: 0.60 x 0.55 in 1.52 x 1.40 cm, Nose: 0.85 x 0.65 in 2.16 x 1.65 cm, Antlers: 0.75 x 0.95 in 1.90 x 2.41 cm, Holly: 0.75 x 0.65 in 1.90 x 1.65 cm, Berries: 0.30 x 0.30 in 0.76 x 0.76 cm. Shapeabilities Coffee Woman Etched Dies Cuppa Coffee, Cuppa Tea Collection by Sharyn Sowell is a set of five dies that includes an intricate cut silhouette of a woman carrying a steamy cup of drink, a floral spray and three words: Just, For and You. Approximate size: for: 0.85 x 0.85 in. 2.00 x 2.20 cm, You: 1.00 x 0.85 in. 2.50 x 2.20 cm, Just: 1.10 x 0.75 in. 2.80 x 1.90 cm, Flower Spray: 1.30 x 3.25 in. 3.30 x 8.30 cm, Coffee Woman: 2.20 x 5.50 in. 5.60 x 14.00 cm. Shapeabilities Blooming Brew Etched Dies Cuppa Coffee, Cuppa Tea Collection by Sharyn Sowell is a die with a beautiful intricate cut design of a floral aroma brewing from a sweet cup with a bird perched in the middle. Bring this hand cut design that Sharyn Sowell is known to your collection. Approximate size: Coffee Garden Bird: 3.90 x 5.25 in. 10.00 x 13.30 cm. Shapeabilities From Our Home to Yours Etched Dies A Sweet Christmas by Sharyn Sowell is a set of 10 dies that can be used in a variety of holiday projects - a great addition to your holiday etched die collection. Spellbinders Shapeabilities cut, deboss, emboss and stencil with a single etched die template. A Sweet Christmas Collection by Sharyn Sowell reflects her amazing cut paper technique through etched dies and stamps. Sharyn Sowell fans can recreate them in their projects be it holiday or every day. Approximate size: Holly Berry (3 pcs): 0.10 x 0.10 in 0.25 x 0.25 cm, Holly Leaves: 0.35 x 0.70 in 0.87 x 1.84 cm, to: 0.55 x 0.40 in 1.40 x 1.00 cm, Our: 0.80 x 0.50 in 2.00 x 1.30 cm, From: 1.00 x 0.40 in 2.50 x 1.30 cm, Home: 1.25 x 0.60 in 3.20 x 1.50 cm, Yours: 1.25 x 0.70 in 3.20 x 1.80 cm, Merry: 1.65 x 0.85 in 4.20 x 2.20 cm, Santa's Sack: 1.70 x 1.80 in 4.30 x 4.60 cm, Christmas: 2.25 x 0.60 in 5.70 x 1.50 cm, Santa: 2.60 x 5.00 in 6.60 x 12.70 cm. 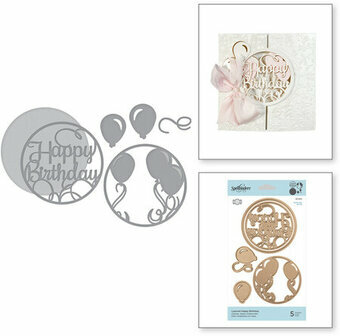 Shapeabilities Layered Happy Birthday Etched Dies Elegant 3D Vignettes Collection by Becca Feeken is a set of five dies includes a circle outline with two themed insert dies and three balloon accents for layering or adding into your projects. Elegant 3D Vignettes Collection by Becca Feeken brings her romantic elegance style to the next level in a threedimensional format. Most of this collection purposively makes a dimensional creation or offers elements to enhance a dimensional piece for a mix or match option. Approximate Size: Outline Circle: 3.26 x 3.26 in. 8.3 0x 8.30 cm, Happy Birthday and Balloon Inserts (2): 2.9 x 2.9 in. 7.40 x 7.40 cm, Balloon 1: 1.30 x 1.00 in. 3.30 x 2.50 cm, String: 1.25 x 0.75 in. 3.20 x 1.90 cm, Balloon 2: 1.10 x 1.00 in. 2.80 x 2.50 cm. Shapeabilities Wandering Butterflies Etched Dies Good Vibes Only Collection by Stephanie Low is a set of four dies which includes two butterfly silhouette shapes and two intricate butterfly designs. An admirer of all things nature and organic in shapes and elements, Stephanie Low was inspired to create Good Vibes Only Collection. It also complements her Cool Vibes Collection to bring your projects to the next level. Approximate Size: Thin Wings: 2.50 x 1.45 in. 6.40 x 3.70 cm, Backer: 2.70 x 1.60 in. 6.90 x 4.10 cm, Wide Wings: 2.40 x 1.25 in. 6.10 x 3.20 cm, Backer: 2.55 x 1.40 in. 6.50 x 3.60 cm. Shapeabilities Crystal Peaks Etched Dies Good Vibes Only Collection by Stephanie Low is a set of six dies which includes one crystal formation with two accent designs in silhouette shapes and two intricate floral designs. An admirer of all things nature and organic in shapes and elements, Stephanie Low was inspired to create Good Vibes Only Collection. It also complements her Cool Vibes Collection to bring your projects to the next level. Approximate Size: Large: 3.75 x 4.50 in. 9.50 x 11.40 cm, L Backer: 3.90 x 4.65 in. 9.90 x 11.80 cm, Ruby: 1.00 x 2.05 in. 2.50 x 5.20 cm, R Backer: 1.15 x 2.20 in. 2.90 x 5.60 cm, Diamond: 1.15 x 1.70 in. 2.90 x 4.30 cm, D Backer: 1.35 x 1.85 in. 3.40 x 4.70 cm. The Shapeabilities Four Seasons Tree Etched Dies Four Seasons by Lene Lok is a one tree shaped etched die that has four coordinating Canopy and Elements Etched Die Set for each season. Immerse yourself in natures beauty symbolized in texture, elements and design that have been created in the Four Seasons Collection by Lene Lok. Spellbinders Shapeabilities cut, deboss, emboss and stencil with a single etched die template. Approximate Size: Four Seasons Tree: 4.00 x 4.10 in. 10.20 x 10.40 cm. Shapeabilities Nordic Blooms Etched Dies Folk Art Collection by Lene Lok comes in a set of 11 dies includes three stem bases, six floral toppers and two accent pieces. 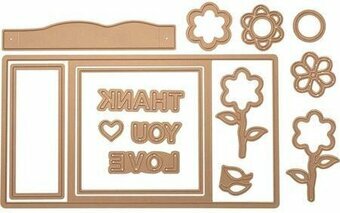 We offer another similar option with S4-882 Nordic Floral Etched Dies set. Folk Art Collection by Lene Lok is inspired by Norwegian folk art with its flower designs featuring scrollwork and flowing lines to create flowing patterns. Bring these whimsical elements into your next projects. Approximate Size: Base: 3 Prong: 1.10 x 1.20 in. 2.80 x 3.00 cm, Round Leaves: 1.20 x 1.20 in. 3.00 x 3.00 cm, Sharp Leaves: 1.20 x 1.20 in. 3.00 x 3.00 cm. Toppers: Daisy: 1.00 x 1.10 in. 2.50 x 2.80 cm, 3 Piece: 0.90 x 1.30 in. 2.30 x 3.30 cm, Spikey: 0.90 x 1.10 in. 2.30 x 2.80 cm, Rosebud: 0.80 x 0.90 in. 2.00 x 2.30 cm, Tulip: 0.80 x 1.00 in. 2.00 x 2.50 cm, Shell: 0.90 x 1.10 in. 2.30 x 2.80 cm, Tear Drop: 0.35 x 0.35 in. 0.90 x 0.90 cm, Scallop Crown: 0.40 x 0.70 in. 1.10 x 1.80 cm. These Shapeabilities Build A House Etched Dies from the Joyous Celebrations Collection by Sharyn Sowell bring joy and celebration. This eight pieces set is all you need to create this sweet structure into a house, a cottage or whatever your imagination takes you - includes a picket fence. Assembled: 4.25 x 2.50 x 3.00 in. Every day is a party with Sharyn's new line of dies and stamps. Her imagery is based on meticulously hand cut silhouettes mixed with a blend of calligraphy and whimsy. This collection will allow you to create and spread Joyous Celebration no matter the event or time of year. 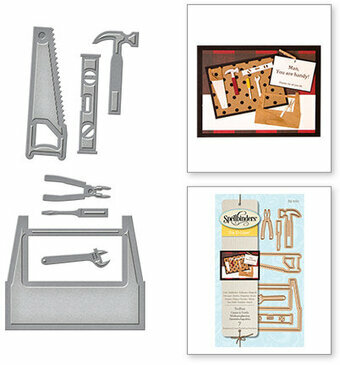 This Die D-Lites Toolbox Etched Die set would make an awesome addition to your die cutting collection. 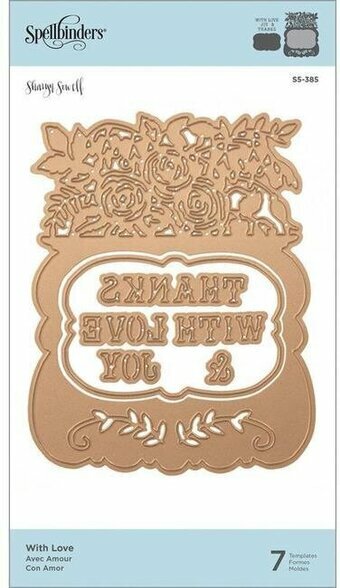 Spellbinders Die D-Lites cut, emboss and stencil with a single die template. Use them in your cards, tags, scrapbook pages and more! This seven piece set has all the tools for fixin'! Includes your basics from a hammer, saw, ruler and even a toolbox! Approximate Size: Screwdriver: 1.25 x 0.25 in, Wrench: 1.25 x 0.25 in, Plier: 1.25 x 0.50 in, Ruler: 0.50 x 1.75 in, Hammer: 0.75 x 1.50 in, Saw: 0.75 x 2.25 in, Toolbox: 2.50 x 2.00 in. Whether you are crafting something for a special friend, or significant other, what could be more perfect than to add a symbol of your love and gratitude, than with a heart. This set designed by Samantha Walker allows you to use the solid outline shapes of the heart independently of their lacy centers. The two center designs are interchangeable with the outside designs. 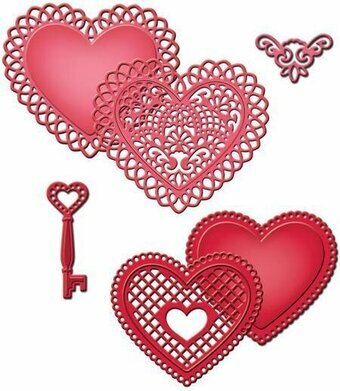 Heart doilies are not just for Valentine's Day anymore! Spellbinders Shapeabilities dies cut, emboss and stencil with a single die template. Approximate Die Template Sizes: Accent: 1 5/8" x 1 1/8", Key: 1" x 2 1/2", Heart 1: 2 5/8" x 2 3/4" (Inset), Heart 2: 2 3/4" x 2 3/8" (Inset), Heart 3: 3 1/4" x 2 7/8", Heart 4: 3 7/8" x 3 3/8". This four piece set is full of beautiful swirled designs that will make perfect accents pieces for your projects. A wonderful addition to your die template collection. Designed by Becca Feeken. Spellbinders Shapeabilities cut, emboss and stencil with a single die template. Approximate Die Template Sizes: 1: 1 1/2 x 1", 2: 1 1/2", 3: 2 x 2", 4: 2 1/4 x 2 1/4". Fancy Lattice has curves that offer a contemporary look to the lattice design. Spellbinders Expandable Patterns dies allow you to expand designs in all direction to create on a larger scale. These detailed die templates are wonderful addition to your creative needs! Approximate Die Template Size: 4" x 6". 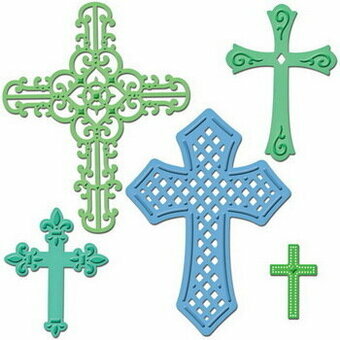 Crosses Two for your faith-based projects! This gorgeous set of stacking crosses includes a large lattice design, Celtic inspired, Fleur de Lis embellished and two simpler, smaller crosses. Use them separately, or stack them to make dimensional pieces. The five sizes and shapes are perfect for cards, scrapbook pages and home decor. Spellbinders Shapeabilities dies cut, emboss and stencil with a single die template. Approximate Die Template Sizes: 3/4" x 1 1/4", 1 3/4" x 2 1/4", 1 7/8" x 2 3/4", 2 7/8" x 4", 3 1/4" x 4". Shapeabilities Swirl Lattice Panel Etched Dies is a lovely lattice panel with its ends designed in a swirl motif with a centered heart design. Blooming Garden Collection by Marisa Job brings sweet floral designs in many forms from accents to boxes to frames. Perfect for special occasions such as weddings, showers or as a lovely gift. Approximate Size: 3.35 x 5.30 in 8.50 x 13.50 cm. Shapeabilities Every Day's a Happy Day Etched Dies Little Loves by Sharyn Sowell is a silhouette of children enjoying the day in blissful spirit. Little Loves Collection by Sharyn Sowell is full of moments captured in the eyes of little ones as they experience the wonders of life and first milestones. Approximate Size: 6.19 x 2.46 in 15.80 x 6.30 cm. Approximate size: Die Template: 3.10 x 3.10 in. 7.80 x 7.80cm, Insert: 1.30 x 1.30 in. 3.50 x 3.50 cm, Circle Offset: 3.40 x 3.40 in. 8.50 x 8.50 cm. This Shapeabilities Ella-Fant Etched Dies My Little Red Wagon by Debi Adams comes with seven dies that bring this adorable elephant design into any of your projects. Spellbinders Shapeabilities cut, emboss and stencil with a single die template. Approximate Size: Tail: 0.30 x 1.00 in. 0.8 x 2.5cm, Ear: 0.90 x 1.00 in. 2.3 x 2.5cm, Water Splash: 0.95 x 0.90 in. 2.4 x 2.3cm, Ella Side View: 1.40 x 1.10 in. 3.5 x 3.8cm, Balloon: 0.80 x 2.35 in. 2.0 x 6.0cm, Ella Body: 1.40 x 1.35 in. 3.6 x 3.5cm, Ella Front View: 2.30 x 1.75 in. 5.8 x 4.5cm. Shapeabilities Coffee Brewing Etched Dies Cuppa Coffee, Cuppa Tea Collection by Sharyn Sowell is a set of four dies that includes four different coffee pot designs. 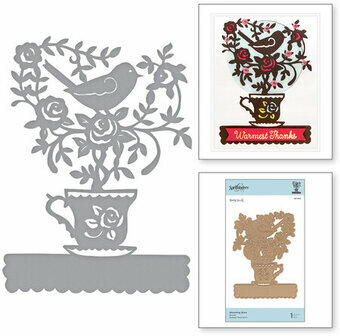 For a Tea Pot option, we offer S4-953 Tea Pots Etched Dies Set. Approximate size: French Press: 1.60 x 2.40 in. 4.10 x 7.00 cm, Percolator: 2.05 x 2.15 in. 5.20 x 5.50 cm, Drip Coffee Pot: 2.35 x 2.40 in. 6.00 x 6.10 cm, Tulip Pot: 2.40 x 2.70 in. 6.10 x 6.90 cm. Shapeabilities Robin and Rosy Mug Etched Dies Cuppa Coffee, Cuppa Tea Collection by Sharyn Sowell is a set of seven dies that includes a mug shape with five accents to add on to the mug: three different rose designs, heart and heart tag. The adorable Robin shape can be perched on top as a sweet element. Approximate size: Tag: 0.50 x 1.40 in. 1.30 x 3.60 cm, Heart: 0.60 x 0.60 in. 1.50 x 1.50 cm, Single Flower: 1.15 x 1.30 in. 2.90 x 3.30 cm, Inner Flower Cut: 1.70 x 1.35 in. 4.30 x 3.40 cm, Double Flowers: 1.90 x 1.10 in. 4.80 x 2.80 cm, Bird: 2.65 x 2.15 in. 6.70 x 5.50 cm, Mug: 3.20 x 2.50 in. 8.10 x 6.40 cm. Shapeabilities Sweet Letters Etched Dies Great, Big, Wonderful World Collection by Sharyn Sowell features a little girl sending off a letter to someone special or maybe she is receiving a special letter. Little adorable helpers are ready to assist! Shapeabilities Mistletoe Gatefold Etched Dies A Sweet Christmas by Sharyn Sowell is a stunning intricate design that will make your A2-size holiday cards stand out. Spellbinders Shapeabilities cut, deboss, emboss and stencil with a single etched die template. A Sweet Christmas Collection by Sharyn Sowell reflects her amazing cut paper technique through etched dies and stamps. Sharyn Sowell fans can recreate them in their projects be it holiday or every day. Approximate size: Gatefold: 2.40 x 5.50 in, 6.10 x 14.00 cm. Die D-Lites Snowflake Etched Dies 2018 Holiday is a set of three intricate designed snowflakes. No two are alike so cut many and create a beautiful wonderland background. Spellbinders Die D-Lites cut, deboss, emboss and stencil with a single etched die template. Approximate size: Snowflake 2: 1.55 x 1.40 in 3.93 x 3.56 cm, Snowflake 1: 1.80 x 1.70 in 4.57 x 4.32 cm, Snowflake 3: 1.75 x 1.60 in 4.44 x 4.06 cm. 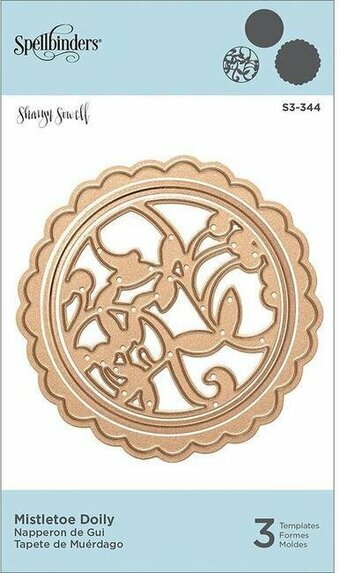 Shapeabilities Graceful Doily Etched Dies Romancing the Swirl Becca Feeken is a set of five dies that includes a large doily shape with a large inner circle and its coordinating inner embossed pattern design. Also included is a smaller inner circle and a doily accent. Many accent options in this set. Approximate Size: Doily: 5.25 x 5.25 in 13.30 x 13.30 cm, Large Inner Circle: 2.80 x 2.80 in 7.10 x 7.10 cm, Inner Pattern: 2.55 x 2.55 in 6.50 x 6.50 cm, Small Inner Circle: 1.50 x 1.50 in 3.80 x 3.80 cm, Doily Accent: 1.30 x 1.30 in 3.30 x 3.30 cm. Shapeabilities Ringlet Round Etched Dies Romancing the Swirl Becca Feeken is a set of four dies that includes a frame outline with its coordinating frame pattern and interior frame outline. Nest and cut all three pieces together to create a stunning open frame shape. An accent piece is included in the set. Approximate Size: Frame Outline: 5.05 x 5.05 in 12.80 x 12.80 cm, Frame Pattern: 4.82 x 4.82 in 12.20 x 12.20 cm, Inside Frame Outline: 2.54 x 2.54 in 6.50 x 6.50 cm, Ringlet Accent: 2.14 x 2.30 in 5.40 x 5.80 cm. Shapeabilities Square Medallion Tiles Etched Dies Exquisite Splendor by Marisa Job is a lovely grid row design of three floral medallion tiles. Shapeabilities Stack o' Cups Etched Dies Cuppa Coffee, Cuppa Tea Collection by Sharyn Sowell is a set of seven dies that includes three different shapes of cup, two insert dies for cup design, five hearts for accents with a sauce to complete the set. Approximate size: Hearts (5 pcs): 0.20 x 0.30 in. 0.50 x 0.80 cm, Floral Embellishment: 1.70 x 0.95 in. 4.30 x 2.40 cm, Tulip Embellishment: 2.00 x 0.90 in. 5.10 x 2.30 cm, Cup 1: 2.65 x 1.70 in. 6.70 x 4.30 cm, Saucer: 2.70 x 0.50 in. 6.90 x 1.30 cm, Cup 2: 2.70 x 1.90 in. 6.90 x 4.80 cm, Cup 3: 2.75 x 2.05 in. 7.00 x 5.20 cm. Shapeabilities Dance for Joy Etched Dies Great, Big, Wonderful World Collection by Sharyn Sowell is a scene of three children holding hands and skipping through the grass. Shapeabilities Especially Made for You Etched Dies brings a smile with the words embedded in a lovely swirled leaf vine. Perfect for special occasions such as weddings, showers or as a lovely gift. Approximate Size: 4.60 x 1.80 in 11.70 x 4.50 cm. Shapeabilities Join the Parade Etched Dies Great, Big, Wonderful World Collection by Sharyn Sowell features a wagon pulling group of children ready to join the parade. Shapeabilities Peace Begins Here Etched Dies Great, Big, Wonderful World Collection by Sharyn Sowell is a wonderful house on a hill with swirly leaf vines encompassing the words, Peace Begins Here. Perfect to frame or add to any project. Shapeabilities Lighting the Way Etched Dies A Sweet Christmas by Sharyn Sowell shares a silhouette of a kind little boy lighting the way for Santa to deliver presents. Spellbinders Shapeabilities cut, deboss, emboss and stencil with a single etched die template. A Sweet Christmas Collection by Sharyn Sowell reflects her amazing cut paper technique through etched dies and stamps. Sharyn Sowell fans can recreate them in their projects be it holiday or every day. Approximate size: Lighting the Way: 4.25 x 3.10", 10.8 x 7.9 cm. Die D-Lites Mistletoe Doily Etched Dies A Sweet Christmas by Sharyn Sowell is a set of three dies. Nest them together to form a magical holiday doily accent for your next project! Spellbinders Die D-Lites cut, emboss and stencil with a single die template. A Sweet Christmas Collection by Sharyn Sowell reflects her amazing cut paper technique through etched dies and stamps. Sharyn Sowell fans can recreate them in their projects be it holiday or every day. Approximate size: Mistletoe Insert: 2.30 x 2.30 in 5.80 x 5.80 cm, Inner Cut: 2.50 x 2.50 in 6.40 x 6.40 cm, Doily: 3.00 x 3.00 in 7.60 x 7.60 cm.